Gaming projects received more than $200 million in pledges during 2013. It's no secret that Kickstarter is in the business of raising money. In fact, helping people raise oodles of cash to finance their dreams is kind of the site's entire shtick. That being the case, it can still be somewhat astonishing to see just how much money actually passes through it over the course of a year. According to its stats for 2013, for instance, some $920 million dollars were pledged to user projects over the course of 2013. 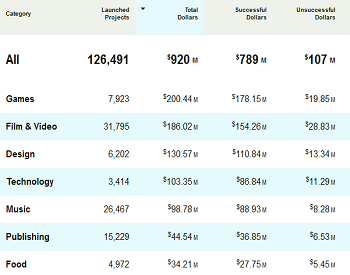 What kind of projects earned the most, you ask? None of other than videogames. Indeed, videogame and gaming projects managed to raise a whopping $200 million in Kickstarter funds this year spread across 7,923 different projects. $178 million of these funds were contributed to successful projects while another $20 million plus was pledged to projects that ultimately failed to reach their goals. The biggest category after videogames was Film & Video which comparatively saw a total of $186 million in total pledges across nearly 32,000 projects. The interesting thing about the scale of these numbers is arguably how they run contrary to concerns that big name developers and publishers might be ruining smaller project's chances by turning to Kickstarter to fund their instantaneously more famous games. While there have certainly been a lot of big name games raising money through Kickstarter and crowdfunding in 2013, the sheer amount of money that went to successful campaigns definitely suggests that gamers are emptying their pockets for more than just the Star Citizens of the world. If nothing else, it will be interesting to see how 2014 pans out and if these numbers remain consistent or even rise in the future.